Vegan Cooking Techniques: Braising. Veggies & Protein. I am a self-taught cook, but I did manage to pick up a few cooking terms along the way. And one key cooking term that professional chef's, Top Chef cheftestants, and cooking-show guru's use a lot, almost as much as Ryan Seacrest uses the phrase "you are safe" on American Idol, is the cooking term braising. So here it is, BRAISING 101. You: Top Chef. It's important to know cooking terms (even if you are already using the technique without knowing the name for it) simply because saying "I braised the collard greens" sounds a lot better than "I cooked the collard greens." "Braising (from the French “braiser”), is a combination cooking method using both moist and dry heat; typically the food is first seared at a high temperature and then finished in a covered pot with a variable amount of liquid, resulting in a particular flavour. Braising of meat is often referred to as pot roasting, though some authors make a distinction between the two methods based on whether or not additional liquid is added." Braising is traditionally used when cooking meat, but you can also braise veggies and vegan protein like tofu. Basically you are high-heat charring the outside of the food item first, then you more slowly cook the food all the way through with a combination of liquid and dry heat. Why Use the Braising Technique? The braising technique brings out the flavor of the food, it seals in the flavor be using a lid on the cooking container, raising also caramelizes the outside and prevents burning the outside of the item, since you are not high-heat cooking the entire time. How to braise veggies. Example: Brussel Sprouts. 1 cup washed, de-stemmed and halved brussel sprouts. Step one: Turn stove to high and place pot on burner. When oil is heated, add brussel sprouts. Step three: When oil is heated, add brussel sprouts and lemon juice. Step four: Allow to cook for about 1 minute on each side. Be sure that sprouts appear browned and charred, but nut burnt to a crisp. Step five: Once all side of sprouts are charred, add in vegetable broth. Step six: Reduce heat and cover pot. Allow to cook for about 5 minutes, depending on sprout size. Shake and toss sprouts often, but do not remove lid excessively. Step seven: When sprouts appear tender and cooked through, remove lid and turn heat back to high. Add salt and pepper and saute on high for a minute. Step eight: Plate, season with lemon juice, oil, salt, pepper and/or herbs. Be sure to say that your 'braised the brussel sprouts." 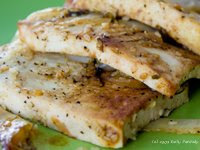 *Braising tofu, seitan or tempeh is very similar to the brussel sprouts. You want to remember to first char the outside, then cover and cook through. *Adding in a small amount of a liquid veggie like onions, tomatoes or carrots is a great way to braise a protein. 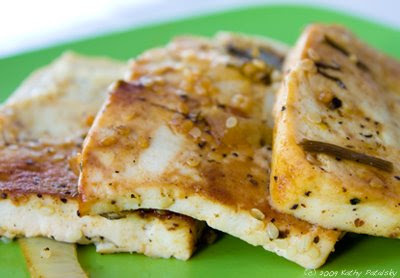 If you ann a 1/4 cup onion to the pot for braised tofu, you can heighten the flavor and add liquid. less veggie broth (or water) can be used. *Adding in an acid like lemon, orange or lime juice OR vinegar is a greant way to enhance the flavors of the food. *You do not need a lot of oil to braise food. In fact, it is possible to braise with zero oil, but you will have to be very careful about burning the food or letting it stick. A good veggie broth or liquid would have to be used in the initial step. But the oil really allows for a delicious criminalization of the food. *Sweet add in. I love adding a tiny bit of agave to my braised veggies or tofu. It helps to brown the edges and gives a very nice braised crust. Simply add a tsp of agave to the oil in the first step. Sweet onions or citrus (like tangerines) are also great to sweeten and caramelize the braised food. *Great flavor enhancers also include: bay leaves, thyme, dill, black or white pepper, cayenne, sea salt, parsley and other fresh herbs and spices. You can add these items at different stages in the cooking process, depending on the recipe. Bay leaves should be added when the veggie broth or braising liquid is added. If you have any braising tips to share please leave them in the comments section!